2. An essay by Nic Lewis expanding on many of the points in the article. He first collaborated with others to expose major statistical errors in a 2009 study of Antarctic temperatures. In 2011 he discovered that the IPCC had, by an unjustified statistical manipulation, altered the results of a key 2006 paper by Piers Forster of Reading University and Jonathan Gregory of the Met Office (the United Kingdom's national weather service), to vastly increase the small risk that the paper showed of climate sensitivity being high. Mr. Lewis also found that the IPCC had misreported the results of another study, leading to the IPCC issuing an Erratum in 2011. Mr. Lewis tells me that the latest observational estimates of the effect of aerosols (such as sulfurous particles from coal smoke) find that they have much less cooling effect than thought when the last IPCC report was written. The rate at which the ocean is absorbing greenhouse-gas-induced warming is also now known to be fairly modest. In other words, the two excuses used to explain away the slow, mild warming we have actually experienced-culminating in a standstill in which global temperatures are no higher than they were 16 years ago-no longer work. The conclusion-taking the best observational estimates of the change in decadal-average global temperature between 1871-80 and 2002-11, and of the corresponding changes in forcing and ocean heat uptake-is this: A doubling of CO2 will lead to a warming of 1.6°-1.7°C (2.9°-3.1°F). A cumulative change of less than 2°C by the end of this century will do no net harm. It will actually do net good-that much the IPCC scientists have already agreed upon in the last IPCC report. Rainfall will increase slightly, growing seasons will lengthen, Greenland's ice cap will melt only very slowly, and so on. Some of the best recent observationally based research also points to climate sensitivity being about 1.6°C for a doubling of CO2. An impressive study published this year by Magne Aldrin of the Norwegian Computing Center and colleagues gives a most-likely estimate of 1.6°C. Michael Ring and Michael Schlesinger of the University of Illinois, using the most trustworthy temperature record, also estimate 1.6°C. The big question is this: Will the lead authors of the relevant chapter of the forthcoming IPCC scientific report acknowledge that the best observational evidence no longer supports the IPCC's existing 2°-4.5°C "likely" range for climate sensitivity? Unfortunately, this seems unlikely-given the organization's record of replacing evidence-based policy-making with policy-based evidence-making, as well as the reluctance of academic scientists to accept that what they have been maintaining for many years is wrong. How can there be such disagreement about climate sensitivity if the greenhouse properties of CO2 are well established? Most people assume that the theory of dangerous global warming is built entirely on carbon dioxide. It is not. There is little dispute among scientists about how much warming CO2 alone can produce, all other things being equal: about 1.1°-1.2°C for a doubling from preindustrial levels. The way warming from CO2 becomes really dangerous is through amplification by positive feedbacks-principally from water vapor and the clouds this vapor produces. It goes like this: A little warming (from whatever cause) heats up the sea, which makes the air more humid-and water vapor itself is a greenhouse gas. The resulting model-simulated changes in clouds generally increase warming further, so the warming is doubled, trebled or more. That assumption lies at the heart of every model used by the IPCC, but not even the most zealous climate scientist would claim that this trebling is an established fact. For a start, water vapor may not be increasing. A recent paper from Colorado State University concluded that "we can neither prove nor disprove a robust trend in the global water vapor data." And then, as one Nobel Prize-winning physicist with a senior role in combating climate change admitted to me the other day: "We don't even know the sign" of water vapor's effect-in other words, whether it speeds up or slows down a warming of the atmosphere. Climate models are known to poorly simulate clouds, and given clouds' very strong effect on the climate system-some types cooling the Earth either by shading it or by transporting heat up and cold down in thunderstorms, and others warming the Earth by blocking outgoing radiation-it remains highly plausible that there is no net positive feedback from water vapor. If this is indeed the case, then we would have seen about 0.6°C of warming so far, and our observational data would be pointing at about 1.2°C of warming for the end of the century. And this is, to repeat, roughly where we are. The scientists at the IPCC next year have to choose whether they will admit-contrary to what complex, unverifiable computer models indicate-that the observational evidence now points toward lukewarm temperature change with no net harm. On behalf of all those poor people whose lives are being ruined by high food and energy prices caused by the diversion of corn to biofuel and the subsidizing of renewable energy driven by carboncrats and their crony-capitalist friends, one can only hope the scientists will do so. I consider the most significant - but largely overlooked - revelation to be the substantial reduction since AR4 in estimates of aerosol forcing and uncertainty therein. This reduction has major implications for equilibrium climate sensitivity (ECS). ECS can be estimated using a heat balance approach - comparing the change in global temperature between two periods with the corresponding change in forcing, net of the change in global radiative imbalance. That imbalance is very largely represented by ocean heat uptake (OHU). Since the time of AR4, neither global mean temperature nor OHU have increased, while the IPCC's own estimate of the post-1750 change in forcing net of OHU has increased by over 60%. In these circumstances, it is extraordinary that the IPCC can leave its central estimate and 'likely' range for ECS unchanged. I focused on this point in my review comments on the SOD. I showed that using the best observational estimates of forcing given in the SOD, and the most recent observational OHU estimates, a heat balance approach estimates ECS to be 1.6-1.7°C - well below the 'likely' range of 2‑4.5°C that the SOD claims (in Section 10.8.2.5) is supported by the observational evidence, and little more than half the best estimate of circa 3°C it gives. The fact that ECS, as derived using the new aerosol forcing estimates and a heat balance approach, appears to be far lower than claimed in the SOD is highlighted in an article by Matt Ridley in the Wall Street Journal, which uses my calculations. There was not space in that article to go into the details - including the key point that the derived ECS estimate is very well constrained - so I am doing so here. The IPCC has placed a huge emphasis on GCM simulations, and the ECS range exhibited by GCMs has played a major role in arriving at the IPCC's 2-4.5°C 'likely' range for ECS. I consider that little credence should be given to estimates for ECS derived from GCM simulations, for various reasons, not least because there can be no assurance that any of the GCMs adequately reflect all key climate processes. Indeed, since in general GCMs significantly overestimate aerosol forcing compared with observations, they need to embody a high climate sensitivity or they would underestimate historical warming and be consigned to the scrapheap. Observations, not highly complex and unverifiable models, should be used to estimate the key properties of the climate system. Most observationally-constrained studies use instrumental data, for good reason. Reliance cannot be placed on paleoclimate proxy-based estimates of ECS - the AR4 WG1 report concluded (Box 10.2) that uncertainties in Last Glacial Maximum studies are just too great, and the only probability density function (PDF) for ECS it gave from a last millennium proxy-based study contained little information. Because it has historically been difficult to estimate ECS purely from instrumental observations, a standard estimation method is to compare observations of key observable climate variables, such as zonal temperatures and OHU, with simulations of their evolution by a relatively simple climate model with adjustable parameters that represent, or are calibrated to, ECS and other key climate system properties. A number of such 'inverse' studies, of varying quality, have been performed; I refer later to various of these. But here I estimate ECS using a simple heat balance approach, which avoids dependence on models and also has the advantage of not involving choices about niceties such as truncation parameters and Bayesian priors, which can have a major impact on ECS estimation. Table 8.7 shows that the best estimate for total aerosol RF (RFari+aci) has fallen from −1.2 W/m² to −0.7 W/m² since AR4, largely due to a reduction in RFaci, the uncertainty band for which has also been hugely reduced. It gives a higher figure, −0.9 W/m², for AFari+aci. However, −0.9 W/m² is not what the observations indicate: it is a composite of observational, GCM-simulation/aerosol model derived, and inverse estimates. The inverse estimates - where aerosol forcing is derived from its effects on observables such as surface temperatures and OHU - are a mixed bag, but almost all the good studies give a best estimate for AFari+aci well below −0.9 W/m²: see Appendix 1 for a detailed analysis. It cannot be right, when providing an observationally-based estimate of ECS, to let it be influenced by including GCM-derived estimates for aerosol forcing - a key variable for which there is now substantial observational evidence. To find the IPCC's best observational (satellite-based) estimate for AFari+aci, one turns to Section 7.5.3 of the SOD, where it is given as −0.73 W/m² with a standard deviation of 0.30 W/m². That is actually the same as the Table 8.7 estimate for RFari+aci, except for the uncertainty range being higher. Table 8.7 only gives estimated AFs for 2011, but Figure 8.18 gives their evolution from 1750 to 2010, so it is possible to derive historical figures using the recent observational AFari+aci estimate as follows. The values in Figure 8.18 labelled 'Aer-Rad Int.' are actually for RFari, but that equals the purely observational estimate for AFari (−0.4 W/m² in 2011), so they can stand. Only the values labelled 'Aer-Cld Int. ', which are in fact the excess of AFari+aci over RFari, need adjusting (scaling down by (0.73−0.4)/(0.9−0.4), all years) to obtain a forcing dataset based on a purely observational estimate of aerosol AF rather than the IPCC's composite estimate. It is difficult to digitise the Figure 8.18 values for years affected by volcanic eruptions, so I have also adjusted the widely-used RCP4.5 forcings dataset to reflect the Section 7.5.3 observational estimate of current aerosol forcing, using Figure 8.18 and Table 8.7 data to update the projected RCP4.5 forcings for 2007-2011 where appropriate. The result is shown below. The adjustment I have made merely brings estimated forcing into line with the IPCC's best observationally-based estimate for AFari+aci. But one expert on the satellite observations, Prof. Graeme Stephens, has stated that AFaci is at most ‑0.1 W/m², not ‑0.33 W/m² as implied by the IPCC's best observationally-based estimates: see here and slide 7 of the linked GEWEX presentation. If so, ECS estimates should be lowered further. The best known study estimating ECS by comparing the change in global mean temperature with the corresponding change in forcing, net of that in OHU, is Gregory et al. (2002). This was one of the studies for which an estimated PDF for ECS was given in AR4. Unfortunately, ten years ago observational estimates of aerosol forcing were poor, so Gregory used a GCM-derived estimate. In July 2011 I wrote an open letter to Gabi Hegerl, joint coordinating lead author of the AR4 chapter in which Gregory 02 was featured, pointing out that its PDF was not computed on the basis stated in AR4 (a point since conceded by the IPCC), and also querying the GCM-derived aerosol forcing estimate used in Gregory 02. Some readers may recall my blog post at Climate Etc. featuring that letter, here. Using the GISS forcings dataset, and corrected Levitus et al. (2005) OHU data, the 1861-1900 to 1957-1994 increase in Q − F (total forcing - OHU) changed from 0.20 to 0.68 W/m². Dividing 0.68 W/m² into ΔT', the change in global surface temperature, being 0.335°C, and multiplying by 3.71 W/m² (the estimated forcing from a doubling of CO2 concentration) gives a central estimate (median) for ECS of 1.83°C. I can now rework my Gregory 02 calculations using the best observational forcing estimates, as reflected in Figure 8.18 with aerosol forcing rescaled as described above. The change in Q - F becomes 0.85 W/m². That gives a central estimate for ECS of 1.5°C. c) the two decades are some 130 years apart, and therefore correspond to similar positions in the 60-70 year quasi-periodic AMO cycle (which appears to have a peak-to-peak influence on global mean temperature of the order of 0.1°C). I summarise here my estimates of the changes in decadal mean forcing, heat uptake and global temperature between 1871-1880 and 2002-2011, and related uncertainties. Details of their derivations are given in Appendix 2. Now comes the fun bit, putting all the figures together. The best estimate of the change from 1871-1880 to 2002-2011 in decadal mean adjusted forcing, net of the Earth's heat uptake, is 2.09 − 0.43 = 1.66 W/m². Dividing that into the estimated temperature change of 0.727°C and multiplying by 3.71 W/m² gives an estimated climate sensitivity of 1.62°C, close to that from reworking Gregory 02. Based on the estimated uncertainties, I compute a 5-95% confidence interval for ECS of 1.03‑2.83°C - see Appendix 3. That implies a >95% probability that ECS is below the IPCC's central estimate of 3°C. § Aldrin et al. (2012), an impressively thorough study, gives a most likely estimate for ECS of 1.6°C and a 5-95% range of 1.2-3.5°C. one is from Olson et al. (2012); the Olson PDF, like Knutti 02′s, is extremely wide and contains almost no information. In the light of the current observational evidence, in my view 1.75°C would be a more reasonable central estimate for ECS than 3°C, perhaps with a 'likely' range of around 1.25-2.75°C. The AR5 WG1 SOD composite AFari+aci estimate of −0.9 W/m² is derived from mean estimates from satellite observations (−0.73 W/m²), GCMs (−1.45 W/m² from AR4+AR5 models including secondary processes, −1.08 W/m² from CMIP5/ACCMIP models) and an "expert" range of −0.68 to −1.52 W/m² from combined inverse estimates. These figures correspond to box-plots in the lower panel of Figure 7.19. One of the inverse studies cited hasn't yet been published and I haven't been able to obtain it, but I have examined the other twelve studies. One of the seven potentially useful studies is based on GCM simulations, which I consider to be untrustworthy. A second does not estimate aerosol forcing over 90S-28S, and concludes that over 1976-2007 it has been large and negative over 28S-28N and large and positive over 28N-60N, the opposite of what is generally believed. A third study is Andronova and Schlesinger (2001), which it turns out had a serious code error. Its estimate of −0.54 to ‑1.30 W/m² falls to −0.42 to −0.99 W/m² when using the corrected model (Ring et al., 2012). Three of the other studies, all using four latitude zones, estimate aerosol forcing to be even lower: in the ranges −0.14 to −0.74, −0.3 to −0.95 and −0.19 to −0.83 W/m². The final study estimates it to be around or slightly above ‑1 W/m², but certainly below ‑1.5 W/m². One recent inverse estimate that the SOD omits is −0.7 W/m² (mean - no uncertainty range given) from Aldrin et al. (2012). In conclusion, I wouldn't hire the IPCC's experts if I wanted a fair appraisal of the inverse studies. A range of −0.2 to −1.3 W/m² looks more reasonable - and as it happens, is centred almost exactly on the mean of the estimates derived from satellite observations. Since it extends back before 1880 and includes a correction to sea surface temperatures in the mid-20th century, I use HadCRUT4 global mean temperature data, available as annual data here. 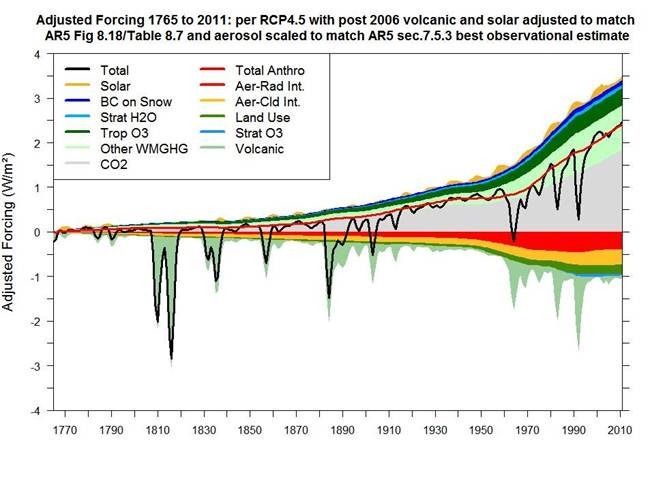 The difference between the mean for the decade 2002-2011 and that for 1871-1880 is 0.727°C. The uncertainty in that temperature change is tricky to work out because the various error sources are differently correlated in time. Adding the relevant years' total uncertainty estimates for the HadCRUT4 21-year smoothed decadal data (estimated 5-95% ranges 0.17°C and 0.126°C), and very generously assuming the variance uncertainty scales inversely with the number of years averaged, gives an error standard deviation for the change in decadal temperature of 0.08°C (all uncertainty errors are assumed to be normally distributed, and independent except where otherwise stated). There is also uncertainty arising from random fluctuations in the internal state of the climate. Surface temperature simulations from a GCM control run suggest that error source could add a further error standard deviation of 0.08°C for both decades. However, the matching of their characteristics as set out in the main text, points a) to c), and the fact that some fluctuations will be reflected in OHU, suggests a reduction from the 0.11°C error standard deviation implied by adding two 0.08°C standard deviations in quadrature, say increasing halfway, to 0.095°C. Adding that to the observational error standard deviation of 0.08°C gives a total standard deviation of 0.124°C. the respective fractional errors in which are common to both periods. Therefore, the error standard deviation for the change in forcing between 1871-1880 and 2002-2011 could well be smaller than that for the forcing in 2002-2011. However, for simplicity, I assume that it is the same. Finally, I add an error standard deviation of 0.05 W/m² for uncertainty in volcanic forcing in 1871-1880 and a further 0.05 W/m² for uncertainty therein in 2002-2011, small though volcanic forcing was in both decades. Solar forcing uncertainty is included in Table 8.7. Summing the uncertainties, the total AF change error standard deviation is 0.45 W/m². I estimate 2002-2011 OHU from a regression over 2002-2011 of 0-2000 m pentadal ocean heat content estimates per Levitus et al. (2012), inversely weighting observations by their variance. OHU in the 2000-3000 m layer is estimated to be negligible. After conversion from zeta Joules/year, the trend equates to 0.433 W/m², averaged over the Earth's surface. The standard deviation of the OHU estimate as computed from the regression residuals is 0.031 W/m², but because of the autocorrelation implicit in using overlapping pentadal averages the true figure will be much higher. Multiplying the standard deviation by sqrt(5) provides a crude adjustment for the autocorrelation, bringing the standard deviation to 0.068 W/m². There is no alternative to using GCM-derived estimates of OHU for the 1871-1880 period, since there were no measurements then. I adopt the OHU estimate given in Gregory 02 for the bracketing 1861-1900 period of 0.16 W/m², but deduct only 50% of it to compensate for the Levitus et al. (2012) regression trend implying a somewhat lower 2002-2011 OHU than is given in the SOD. Further, to be conservative, I treble Gregory 02′s optimistic-looking standard deviation, to 0.03 W/m². That implies a change in OHU of 0.353 W/m², with a standard deviation of 0.075 W/m², adding the uncertainty variances. Although Gregory 02 ignored non-ocean heat uptake, some allowance should be made for that and also for any increase in ocean heat content below 3000 m. The (slightly garbled) information in Section 3.2.5 of the SOD implies that 0-3000 m ocean warming accounts for 80-85% of the Earth's total heat uptake, with the error standard deviation for the remainder of the order of 0.03 W/m². Allowing for all components of the Earth's heat uptake implies an estimated change in total heat uptake of 0.43 W/m² with an error standard deviation of 0.08 W/ m². Natural variability in decadal OHU should be the counterpart of natural variability in decadal global surface temperature, so is not accounted for separately. In the table of changes in the variables between 1871-1880 and 2002-2011, I split the AF error standard deviation between that for CO2 and other greenhouse gases (0.291 W/m²), and for all other items (0.343 W/m²). The reason for doing so is this. Almost all the SOD's 10.2% error standard deviation for greenhouse gas AF relates to the AF magnitude that a given change in the greenhouse gas concentration produces, not to uncertainty as to the change in concentration. When estimating ECS, whatever that error is, it will affect equally the 3.71 W/m² estimated forcing from a doubling of equivalent CO2 concentration used to compute the ECS estimate. Most of the uncertainty in the ratio of AF to concentration is probably common to all greenhouse gases. Insofar as it is not, and the relationship between changes in greenhouse gases is different in the future to in the past, then the two AF estimation fractional errors will differ. I ignore that here. As most of the past greenhouse gas forcing is due to CO2 and that is expected to be the case in future, any inaccuracy from doing so should be minor. One then computes a histogram for the million ECS estimates and finds the points below which 5% and 95% of the total estimates lie. The resulting 5-95% range comes out at 1.03 to 2.83°C. Yet he fails to find a single basic math or science error in my piece. and then fail to produce a single example of my failing to do simple math. He says I apparently don't know the difference between water vapor and clouds. He produces no evidence for this absurd claim, which is wrong. Water vapor is a gas; clouds are droplets of liquid water that condense from water vapor. I do know the difference. it is very clear water vapor … is an amplifying effect. It is a very strong warmer for the climate. water vapor itself is a greenhouse gas. So there is no confusion there. At least not on my part. Cloud feedbacks remain the largest source of uncertainty. The net radiative feedback due to all cloud types is likely positive. The key point is this. The cloud forcing values are derived from climate models; we have already seen that climate models have some fundamental problems in how clouds are treated (e.g. aerosol-cloud interactions, moist thermodynamics). So, climate model derived values of cloud forcing should be taken with a grain of salt. Empirically based determinations of cloud forcing are needed. At AGU, I spoke with a scientist that has completed such a study, with the paper almost ready for submission. Punchline: negative cloud feedback. "I know of no evidence that would suggest that the temperature effect of sulfur emissions are small." "Table 8.7 shows that the best estimate for total aerosol RF (RFari+aci) has fallen from −1.2 W/m² to −0.7 W/m² since AR4, largely due to a reduction in RFaci, the uncertainty band for which has also been hugely reduced. It gives a higher figure, −0.9 W/m², for AFari+aci. However, −0.9 W/m² is not what the observations indicate: it is a composite of observational, GCM-simulation/aerosol model derived, and inverse estimates." "On the contrary there is now very good evidence that a lot of heat is going into the deep ocean in unprecedented ways…"
and then provides a link to an article citing a study estimating the Earth's current heat absorption as 0.5 W/ m². So what "fairly modest" figure does Nic Lewis use? Actually slightly higher: 0.52 W/m²! This is not true. I define sensitivity clearly as the temperature change for a doubling of CO2. I am not talking about the Transient Climate Response, which relates to temperature change only over a 70 year period. There is no confusion at my end. "It is worth pointing out that there is a healthy debate about Schlesinger's low estimate". "Additionally, our estimates of climate sensitivity using our SCM and the four instrumental temperature records range from about 1.5 ̊C to 2.0 ̊C. These are on the low end of the estimates in the IPCC's Fourth Assessment Report. So, while we find that most of the observed warming is due to human emissions of LLGHGs, future warming based on these estimations will grow more slowly compared to that under the IPCC's "likely" range of climate sensitivity, from 2.0 ̊C to 4.5 ̊C." Combining extensive sea and land surface temperature reconstructions from the Last Glacial Maximum with climate model simulations, we estimate a lower median (2.3 K) and reduced uncertainty (1.7 to 2.6 K as the 66% probability range, which can be widened using alternate assumptions or data subsets). Assuming that paleoclimatic constraints apply to the future, as predicted by our model, these results imply a lower probability of imminent extreme climatic change than previously thought. Our analysis also leads to a relatively low and tightly-constrained estimate of Transient Climate Response of 1.3-1.8°C, and relatively low projections of 21st- century warming under the Representative Concentration Pathways. For uncertainty assumptions best supported by global surface temperature data up to the present time, this paper finds a most likely present-day estimate of the transient climate sensitivity to be 1.6 K, with 90% confidence the response will fall between 1.3 and 2.6 K, and it is estimated that this interval may be 45% smaller by the year 2030. The authors calculate that emissions levels equivalent to forcing of less than 475 ppmv CO2 concentration are needed to ensure that the transient temperature response will not exceed 2 K with 95% confidence. Mr Romm seems confused about methane outgassing feedbacks, arguing that even if climate sensitivity is low, these may dominate. Suffice to say that in this he has drifted a long way from the consensus. Mr Romm seems determined to rule out even the possibility of low climate sensitivity in the teeth of strong evidence. I can see why he wishes to do so, his job depending on there being a dangerous future. I do not understand where he gets his certainty. Finally, Mr Romm throws the term "anti-science" at me, again with no evidence. I cited peer reviewed papers and made the scientific argument that the latest data be considered in estimating sensitivity. That is pro science. What is anti-science is to make false accusations and try to shut down legitimate debate. Hard working people all over the world are now risking their lives as well as their wallets for the consequences of current climate policy (see Indur Goklany's paper "Could biofuel policies increase death and disease in developing countries?" http://www.jpands.org/vol16no1/goklany.pdf). They have a right to ask that those who determine the science behind such policies are open-minded. On the evidence of MrRomm's astonishing outburst, my doubts about this are growing.